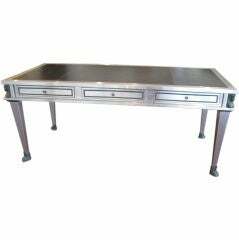 Presenting a fabulous Egyptian Classical Revival desk from the mid-20th century. From circa 1970. This is what is known as an Egyptian made desk in the neoclassical revival style, complete with ormolu neoclassical figures and heads, marble columns, etc. The wood is walnut and it has fantastic detail to it to include boxwood stringing and paneling. 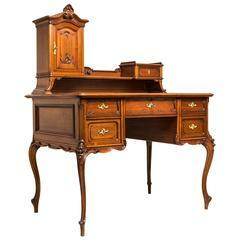 The desk top is a burgundy leather with gilt edging. The desk top sits on top of two pedestals. 3 drawers on the seating side and 2 large side drawers on the pedestals with convex fronts. Very good. One or two very minor &lsquo;dings&rsquo; or &lsquo;bruises&rsquo; but do not adversely affect the piece. 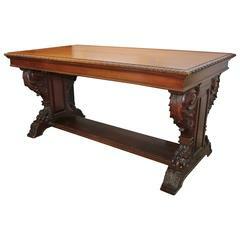 19th century Gothic Revival Scottish library table or desk. Early 20th century Italian Renaissance Revival console or occasional table or desk cabinet carved ebonized wood and plywood. Measures cm: H 82, W 100, D 52.